It was a happy Christmas in 2007 when Santa, well actually my niece, gave me a short-handled Cobrahead. I had given my family subtle hints that this is what I wanted for Christmas, mostly in the form of emails with a gift list that included just the Cobrahead and a link to the site to purchase it. My family is good at getting these kinds of hints and figuring out what they mean. So my niece, who had drawn my name in the Top Secret Family Gift Exchange, had no real choice but to buy it for me. Then when spring finally arrived in 2008, I took my new Cobrahead outside, like a kid with a new bike who has waited an eternity for the snow to melt, and dug up my first weed with it. Right then I wondered how I had gardened successfully for all those years without it. It is now one of the main tools I use when I embrace weeding. 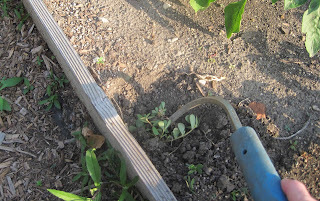 Since then, I have continued to use my short-handled Cobrahead to banish all kinds of weeds and over-grown perennial seedlings from my garden. I’ve used it make furrows to plant bean seeds and to dig out dandelions in the lawn. When you see the Cobrahead, its pretty easy to see how it works. Look how it took out this purslane in my garden! Look how cleanly it pulled out that perennial seedling from the path in the garden, roots and all! I’ve always said gardening is more fun with good tools, and the Cobrahead is a very good tool. If you've been to a Spring Fling you know that the Cobrahead family members are real gardeners who have generously supported garden bloggers from the beginning with opportunities to win Cobrahead tools at the last two Spring Flings. One lucky gardener is going to win a short-handled Cobrahead this Friday. Maybe it will be you? To enter this drawing, leave your name and blog link in the Mr. Linky widget below and then comment on why you want a Cobrahead. Then on Friday at 5:00 PM EDT, I’ll pick a random number to chose the winner. If you don’t have a blog to link to, you can put your name in Mr. Linky with a link to www.cobrahead.com and then put your contact info in your comment or send an email to me at Indygardener at gmail dot com with your contact info so I can reach you if you are the lucky winner. One entry per person, please. Yes, this drawing is open to everyone. Many thanks to the great people at Cobrahead for sponsoring this give-away! Updated 08/21 5:00 PM - Times up! Winner will be chosen from the 60 listed below! Stay tuned! do i get extra points for getting here first? I want a Cobrahead because I was so envious of Shawna's at Spring Fling! Also, I have weeds. Why I need a Cobrahead: bermuda, purslane, nutsedge, henbit, bindweed, dichondra, filaree...help! I actually bought a Cobrahead after seeing them at Spring Fling. But my daughter, who is a new gardener, would get one for Christmas if I won one! Thanks to Cobrahead for sponsoring the giveaway! I can't truly be considered a professional gardener without a Cobrahead. I pull weeds everywhere I go. It's a habit. Since I smashed my thumb with the hammer and the nail is half gone for a spell, it makes weeding a bit more problematic. I need a Cobrahead until my thumb nail returns, by then I may never hand weed again. I also love my cobrahead. I use that the most of all my tools. It does everything. I hope your lucky winner enjoys theirs. Yeah! This might get me to really weed aggressively! ooOOOOooo... I would love that for my burgeoning vegetable garden! Or the purslane that would love to take over my front yard! It really seems to be very useful tool. I can't buy it here. I don't need another one. My dear BIL bought me one for my birthday after seeing them at the SF and I was saying how I thought it would be useful. I was right it is very useful. I want to have a cobrahead because all the best gardeners have them and I want to be part of that group. I'll join in the lamenters with Bermuda grass. Crab grass is at least easy to pull, but not this stuff. I need a Cobrahead because as my body ages, neither my desire to garden nor the weeds wane. Therefore, I need the best tools available to feed my addiction. 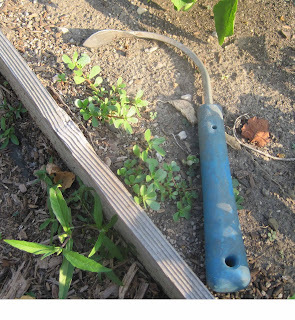 That would be the perfect tool to weed between the vegetables in the raised bed garden! I've never even heard of a cobra head, but once I read your description I knew it was the tool for me. Love to use it in my perennial garden and my soon to be expanded vegetable garden. Pick me please! oh the help i need with weeds! this would be a great tool for us out here..:) thanks! As my blog indicates, I'm in the weeds. This summer is no different. No matter how much I work at it, there are still weeds to conquer! I never heard of a Cobrahead before today. Now I can see how people get motivated to pull weeds. I'd sure pull weeds if I had a Cobrahead to do it with. We have areas of super hard clay, compacted soil - this would hopefully help with weeding those areas! I also love the idea of using it to make holes for planting beans. I want a Cobrahead because... I have an issue with weeds. My hands hurt from trying to get them out. In short... I need help! I'd like to win one of these because I'm intrigued. I've been eyeing them for a while, but I can't quite bring myself to believe they work as well as everyone says. That one little blade? really? It looks like a handy-dandy tool! I'm a weeding fanatic and the short-handled Cobrahead sounds like a dream tool. And.....my family is not nearly as perceptive as yours when it comes to gift hints. I really want to win this! I would love to embrace the weeding, too. I will have one somehow. It's right up there with a Wii for a Christmas present. That looks like a fun tool to have, I think I need one! You had me when you said you used it to plant bean seeds. Good idea! i am still such a novice that i do not own a single hoe - can you believe it? my poor little hands could use some help. Why do I want one? Weeds! I need a Cobrahead because, like everyone else, I have a terrible weed problem! Plus with the remnant lava rocks in my back yard, I am in desperate need of something tough! I often pull weeds with my gloved (sometimes bare) hands. 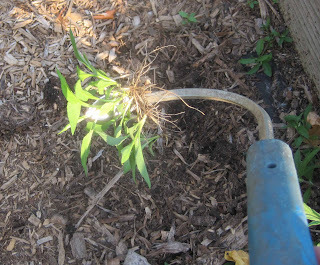 Occasionally the garden trowel assists with the tap rooted ones. But I'd love to try a "real" weeding tool, and find out what I've been missing. I certainly have no shortage of weeds to tackle with it. I would like the Cobrahead because I am all about free stuff and gardening with a real cobra is uncomfortable and not that effective. I can't believe I don't have a Cobrahead! I think I reeeeely need one. Sounds great. I have a cobra head weeder and it is the GREATEST tool I have ever bought on an impulse. I want another one so that I can have one that permanently resides in the vegetable garden because I am constantly wandering around looking for the one I have. Also, it would be great to have a second one for when we are planting out onion plants or garlic, because we work from opposite sides of the garden bed to do this and Jim needs a cobra head of his very own to make his half of the task easier. I need the Cobrahead so I can stay ahead of my husband who rids weeds with a spray and I hate sprays. Please pick me and save my back. I do a lot of work on my hands and knees and have been wanting a more appropriate tool than my Korean Hoe which I love - in the spring. I've certainly got summer and fall weeds. I need a Cobrahead because I've tried everything else. My current favorite is a thing with a curved serrated blade (like a mini-scythe), but I'm fickle. I am always looking for efficient tools for the garden. I haven't seen these in the stores, but it looks awfully fabulous at getting into tight spots, and I have lots of those. And if you haven't see my garden as of late -- I need to weed!!! Thanks for making it possible for us blog readers who are not blog writers to enter your giveaway. I subscribe to your blog in feed reader and enjoy reading about your gardening experiences. This looks like a tool that would work well in the gravel. And I'll post my email here, too. Are you guys really gardeners?! Why would you pull up your purslane? Everything above the soil is totally edible, tasty, and nutritious! It's also a nice living mulch. Next, you'll be talking about your efforts to remove oxalis from your garden beds! But seriosuly, since yall are gardeners and not lawn enthusiasts, I'm disappointed that you fall into the trappings of labeling something a weed that has so many benefits for both you and your garden. I just noticed some growing in my yard and was delighted. So much so that I immediately grabbed a bag and proceeded to tediously collect seeds so that I can purposely cultivate it.